Pope Francis’ fifth day in the U.S. started with a plane ride from New York City’s J.F. Kennedy International Airport to Philadelphia’s International Airport where he was welcomed by a group of dignitaries, including local church officials and Philadelphia Mayor Michael Nutter. The Pope, however, reserved his greatest affection and hug for Gabrielle Bowes, daughter of former Philadelphia police officer Richard Bowes who had been shot and injured in the line of duty. As the Pope’s car was about to join the motorcade to leave the airfield, he stopped, got out and greeted a group of people craning to see him from behind a security barrier. Among them was Michael Keating, 10, who was in a wheelchair. 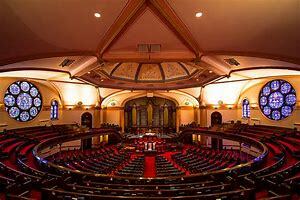 Francis then went to the Cathedral Basilica of Sts. Peter and Paul, where he celebrated mass. 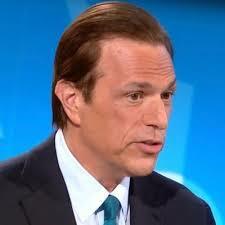 Next was a trip to Independence Hall where he spoke about religious liberty and immigration before a crowd of 50,000. That evening he attended the Festival of Families in the city with an estimated 1 million people and gave remarks. At the Cathedral Francis was welcomed by Philadelphia’s Archbishop, Charles J. Chaput, who jokingly said, “This is a city that would change its name to Francisville today.” Among the 2,4000 people in the pews were bishops, priests and nuns from Pennsylvania. “’What about you?’ I would like to dwell on two aspects of these words in the context of our particular mission to transmit the joy of the Gospel and to build up the Church, whether as priests, deacons, or members of institutes of consecrated life. “During these days of the World Meeting of Families, I would ask you in a particular way to reflect on our ministry to families, to couples preparing for marriage, and to our young people. I know how much is being done in your local Churches to respond to the needs of families and to support them in their journey of faith. I ask you to pray fervently for them, and for the deliberations of the forthcoming Synod on the Family. After visiting Independence Hall, to an orchestra’s playing of Aaron Copland’s “Fanfare for the Common Man,” Francis went in front of the building to the lectern used by Abraham Lincoln to deliver the Gettysburg Address. There Francis gave his address extolling the principles of the country’s founding fathers embodied by the Declaration of Independence signed in that building. 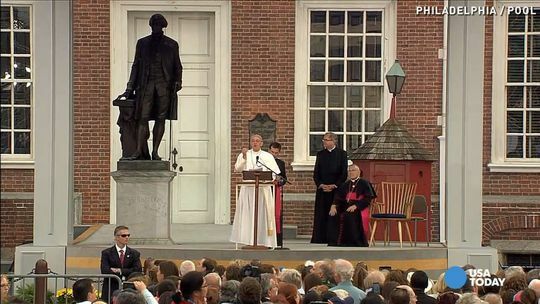 (The above photograph shows Pope Francis at the lectern to the right of the statue of George Washington in front of the entrance to Independence Hall.) Here are the words of that address. “Dear friends, I thank you for your warm welcome and for joining me here today. May this country and each of you be renewed in gratitude for the many blessings and freedoms that you enjoy. And may you defend these rights, especially your religious freedom, for it has been given to you by God himself. May he bless you all. I ask you, please, not to forget to pray for me. 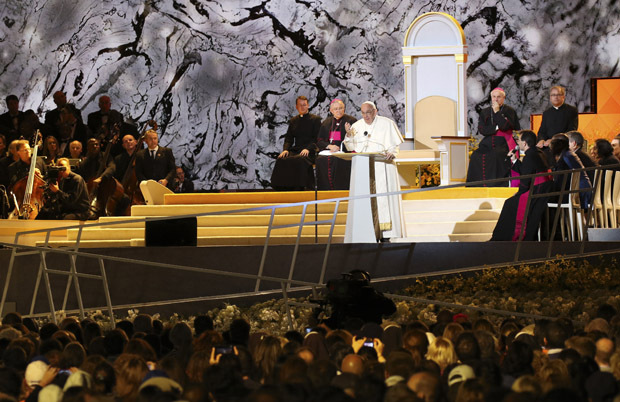 The Pope ended the day with an appearance at the large gathering of people at the Festival of Families, an intercultural celebration of family life around the world. There were musical acts — Aretha Franklin, Sister Sledge, The Fray and the Philadelphia Orchestra— with testimony from six families from around the world and readings. When the time case for Francis to speak, he abandoned his prepared speech (in English) about the need for government support for families. Instead, as shown in photograph to the left, for 25 minutes Francis delivered the following extemporaneous remarks in Spanish (here in English translation). 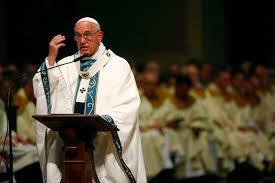 Heller, Seilers & Ruane, In Philadelphia, Pope Francis challenges Americans to live up to nation’s ideals, Wash. Post (Sept. 26, 2015); Pope Francis’ Homily at the Basilica of Sts. Peter and Paul Mass (Sept. 26, 2015). Pope Francis’ Remarks at Independence Hall, N.Y. Times (Sept. 26, 2015); Yardley & Wakin, At Independence Hall, Pope Offers a Broad Vision of Religious Freedom, N.Y. Times (Sept. 26, 2015).